Yes, this feeling is real. Yet, always looking to feel. Now I hold an apple whose memories I peel. No; bury far, far under the ground. Like a mailbox made of other times and places. In the past serving as reminders. Life is.. Not having, not owning, not buying; but knowing, remembering, and being… as these are the only things that ever truly belong to us; we enter this world with one purpose and leave this life with all of the memories and knowledge we have obtained along the way. Everything else stays here. So I thought I had a bad day..
Woke up tired, forgot half of the things I needed at home, even after going back to my apartment to get them. Took me 30 minutes to find parking after sitting in traffic for an hour. Gas took 20 minutes to fill in the middle of a northeaster. Took another hour to get home. Wallet broke, I’m not doing much better. Didn’t have enough cash in broken wallet to do laundry tonight after dowsing my clothes in laundry detergent. Zipper broke on backpack and jacket, and I’m drenched. But.. I have a place to call home. I have money in my wallet even though it’s not full. Even though I get wet, I have a place to go. I have a car to sit in traffic in. I have clean clothes. I have a family to call when things get bad. I have good health, and most importantly I am grateful to have the problems I do. Sigh… I spend so much of my life trying to get away from drama, but as Buddhism teaches, the opposite of something is essentially the same as the thing that you are trying to escape. It’s like fighting hunger with starvation, greed with poverty, love with hate… I guess, in this sense, life is very much a game of opposites. 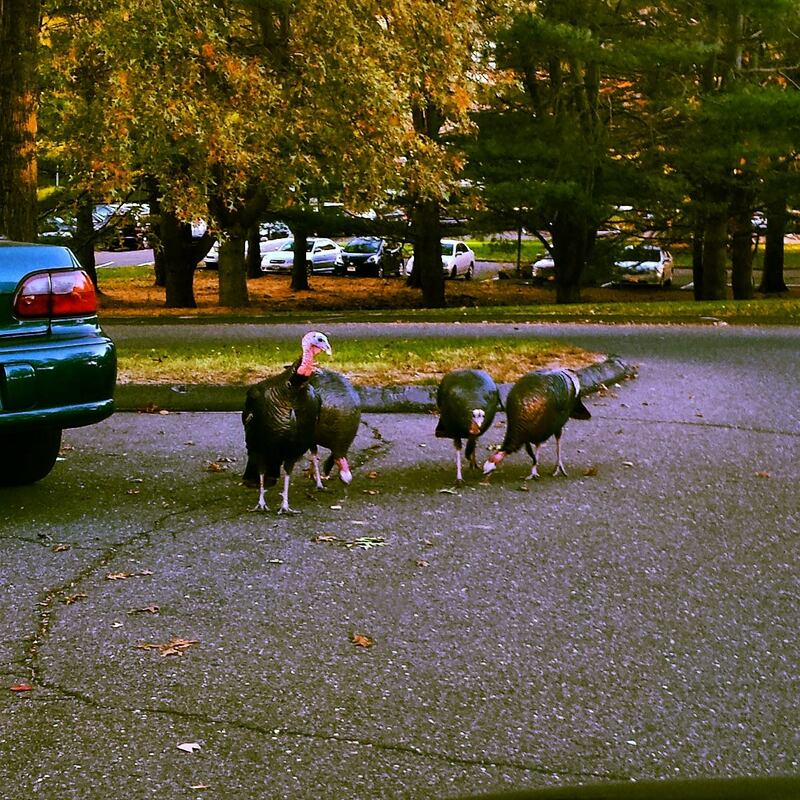 Enlightenment must be more about negating both the good and the bad, and just being… like these turkeys.